I always have a bottle of XO Sauce in the fridge, so I like to think of new uses for this ingredient. 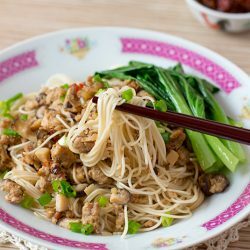 XO Sauce is a gourmet Cantonese seafood sauce made up of dried scallops & dried shrimps among other ingredients, and it can be eaten on its own as a condiment or used in stir-fries. This is my lazy, quick & simplified version of XO Sauce noodles aka zha jiang mian 炸酱面 (“zha jiang mian” is a popular Northern China dish; it translates as fried meat sauce noodles). The result tastes gourmet, thanks to the XO Sauce. It definitely makes a quick and balanced one-dish meal with the blanched greens at the side. 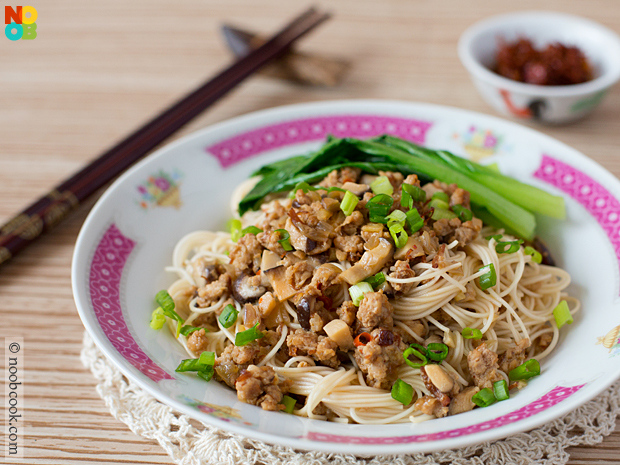 This is the XO Sauce version of Zha Jiang Miang (Chinese fried meat sauce noodles). 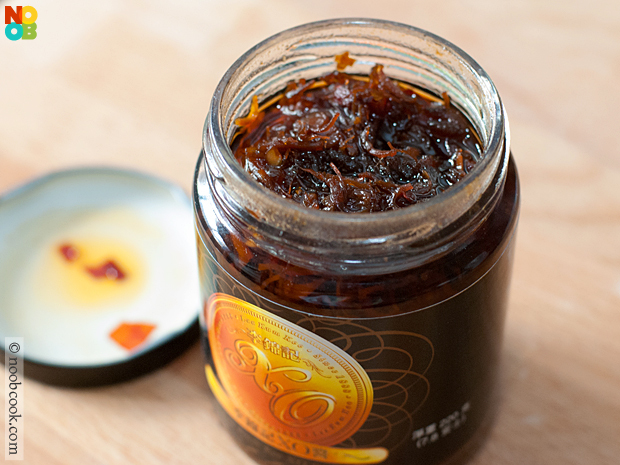 It always handy to have a bottle of XO sauce in the kitchen, where it can be eaten on its own as a condiment or used in stir-fries. In a bowl, marinade minced meat with (A) for 10 minutes. Heat oil in wok and add shallots & ginger; stir-fry until shallots are softened and fragrant. Add minced garlic and stir fry for 30 seconds. Add diced mushrooms and marinated meat. Stir fry until the meat is cooked on the surface, breaking the mince to smaller pieces using a frying turner/spatula. Add 1/2 cup water, simmer on low heat with lid on for about 5 minutes, or until the meat sauce liquid is reduced. Set aside the cooked minced meat topping. In a pot of water with some cooking oil added, blanch baby boy choy for about 20 seconds, followed by noodles according to timing indicated on packaging. Set aside. Toss 1 serving of noodles with about 3 tbsp of meat sauce, adding some water used to cook the noodles to help bind the ingredients together if the noodles are too dry. 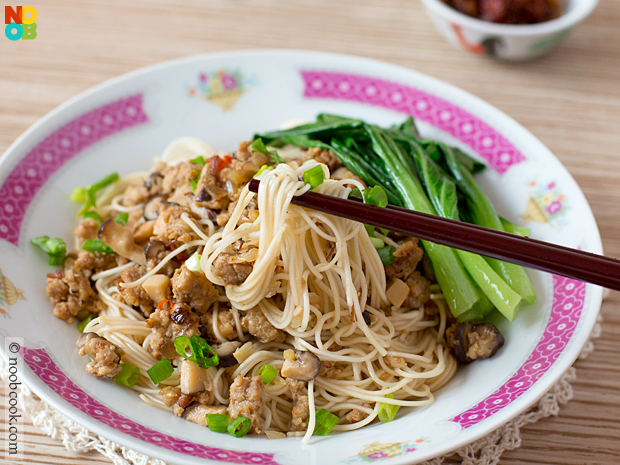 Transfer meat noodles to serving dish and top with blanched greens and spring onions. Serve with a side condiment of XO sauce.